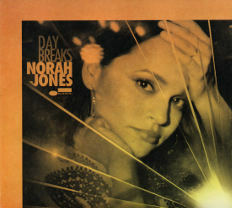 George Graham reviews Norah Jones' "Day Breaks"
From time to time artists arrive on the music scene who come to personify a particular style. Sometimes it’s because they invented it, or often because they popularized it. One of those performers is Norah Jones, who in 2002 turned out to have an unexpected and major hit with her breezy, jazz influenced ballady style. She was what some of us musical pundits call a chanteuse. That kind of style has been around for decades, coming from the jazz and even the theatrical world, Ms. Jones was able to capture the ears of many who might not have heard the jazz-influenced singers that she drew upon. She did manage to bring her own musical signature to the music, and was not just a revivalist. Since then, she has tried a lot of things musically. But now she is out with a new recording more or less in the style of her breakthrough album Come Away With Me. The new release is called Day Breaks. Norah Jones is the daughter of the late Indian sitar virtuoso Ravi Shankar and American concert promoter Sue Jones. Though she was born in New York, she spent much of her childhood in Texas. She had a musical upbringing, attending a performing arts high school in Dallas, and spent summers at the Interlochen Center for the Arts in Michigan, with a more classical direction, and then attended the University of North Texas, with its famed jazz program, majoring in jazz piano, and singing with the college vocal group. While at North Texas, she happened to give a ride to a band playing at the school, which included Jesse Harris, and they soon struck up a friendship and started collaborating, which led to many of the songs on Ms. Jones’ hit debut album, including I Don’t Know Why. She moved to New York in 1999, and there was working as a lounge singer and performing in a number of different groups. Growing up in Texas, Ms. Jones was naturally exposed to a lot of country music, and that has been something of a thread through her career. After Come Away With Me, she moved gradually toward a more electric sound, which left many of her early fans rather cold. But she is an artist who likes to do musical exploration. Her country influence came to the fore on project of which she was a prominent part, The Little Willies, in which they did overs of old country songs. In 2013, she did a duo album with Green Day lead vocalist Billy Joe Armstrong called Foreverly, revisiting a number of songs made famous by the Everly Brothers. And the following year, she was part of an all-female trio called Puss n Boots, who did a straight country album. But after all of that, from country to alternative rock, Norah Jones is back more or less where she started on her new release Day Breaks, and already it’s getting a good deal of praise from critics. I would also count myself among those. Adding to the jazz authenticity is the presence of one of the genre’s great sax players, Wayne Shorter, plus drummer Brian Blade and bassist John Patitucci. While most of the music is original, she also covers tunes by jazz notables Horace Silver and Duke Ellington. The sound is generally relaxed but I would not really call it an album of jazz ballads. Sometimes the energy rises to the level of rock, and the music often gets into a bluesy groove. Ms. Jones also puts in some respectable piano work as well. The album closes with the most straight-out jazz tune on the album, Duke Ellington’s Fleurette Africaine (African Flower). The piece does not have any lyrics we know about, so Ms. Jones does it wordlessly and plays some nice piano while Wayne Shorter adds to the haunting atmosphere. Norah Jones’ new album Day Breaks, brings back the pioneering chanteuse to the jazz influence on which her musically diverse career started, something which will probably please many of her long-time fans. She has assembled an excellent group with jazz players including Wayner Shorter, John Patiticci, and Brian Blade. Jazz organist Dr. Lonnie Smith even puts in a cameo appearance. Ms. Jones is in fine form, featured as much on piano as vocally. Her songwriting is also up to standards, with many of the compositions being collaborations with others, including Sarah Oda, who puts in some backing vocals, and keyboard Pete Remm, who also appears on the album. And there are also the interesting covers of two jazz tunes and a Neil Young song. Our grade for sonic quality is a B-minus. For an intimate-sounding recording like this, the sound is cold, dark and dry, it’s compressed too much and occasionally, Ms. Jones’ vocal can sound overdriven, as if trying to emulate the inadequacies of old analog equipment. A project like this should be warm, clean and natural, like a real jazz group playing live. In the 14 years since her debut album, Norah Jones has left a considerable influence on the music world with her popularity first as a chanteuse and then going off into other musical directions. Day Breaks is a kind of homecoming for her, and a most welcome one. Her added maturity gives the music an even better sense of authenticity. The album is a highlight of her career.